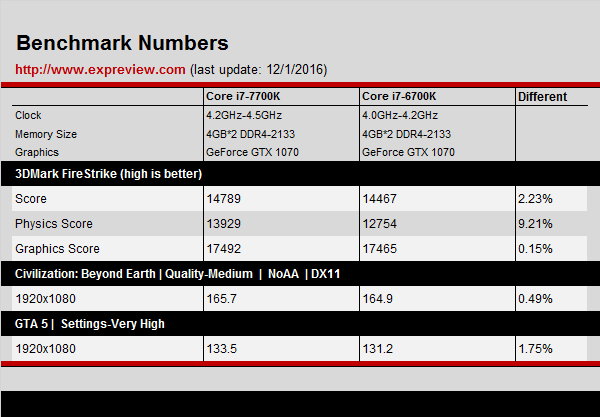 Another day and we have another full review of the Core i7-7700K Kaby Lake processor from Expreview. 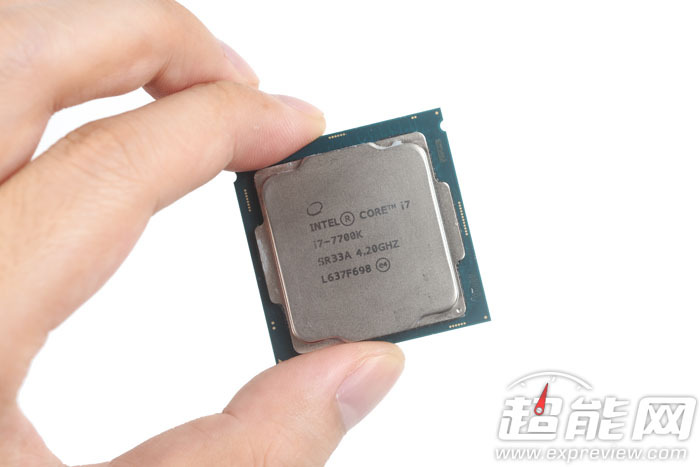 The latest review pits the 7700K against the 6700K in several benchmarks. Intel’s Kaby Lake processors are scheduled for launch on 5th January 2017. The launch is less than a month away and we have already seen two independent performance reviews published. The latest one by Expreview will be the third performance test published for the Core i7-7700K processor. The other two tests were posted by Tomshardware and Nova Tech. The Core i7-7700K is the top brass of the Kaby Lake processor family. It is based on the existing 14nm process node which has seen improvements due to a matured manufacturing technique. Intel calls the optimized node 14nm+ (Plus). These process improvements result in better clock gains under the same TDP headroom as Skylake. Kaby Lake gets most of its architectural hierarchy from Skylake and next to no gains in the IPC department. The performance improvements come solely from the clock speed bump. 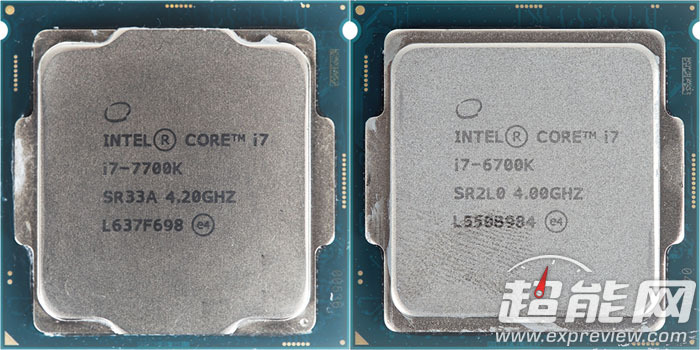 The processor has been compared against the Core i7-6700K Skylake processor which is the flagship chip of the 6th generation family. The tests from the Chinese site are interesting since they also provide clock-to-clock comparisons which we will see in a bit. The tests were conducted on a Intel Z270 series motherboard, featuring a GeForce GTX 1070, G.SKILL 8 GB DDR4 (2133 MHz), a Sandisk Extreme Pro 240 GB SSD and the Prolimatech Mehahelms cooler. 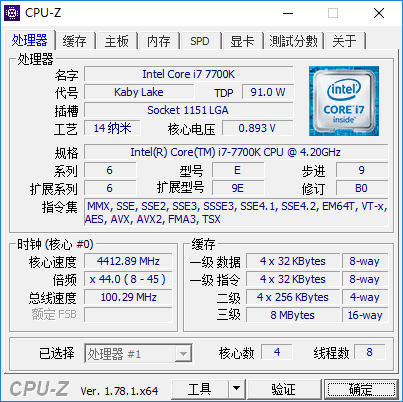 The site didn’t disclose the Z270 motherboard name due to NDA and has a certain bug that displays CPU voltage incorrectly. 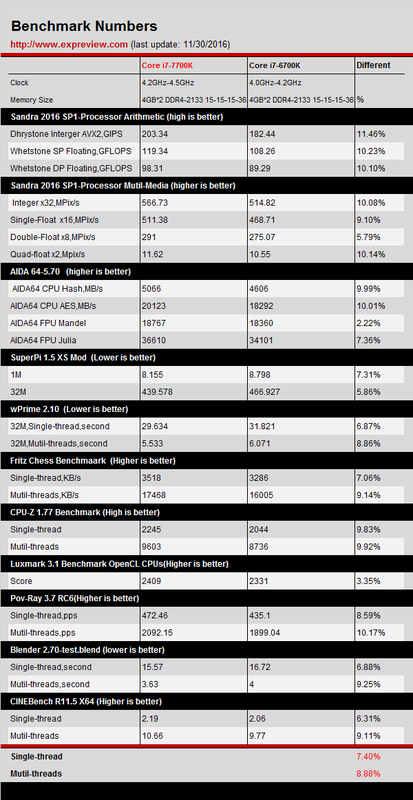 The first numbers we have are the CPU performance tests. Both CPUs were kept at stock settings and were tested through 11 different CPU tests (Single/Multi Threaded). The result is that the Core i7-7700K is up to 7.40% faster on average in single-threaded and up to 8.88% faster on average in multi-threaded performance compared to the Core i7-6700K. It should be pointed that the boost clock of the 7700K is 7% higher than the 6700K so it’s easy to tell that the performance increase comes directly from the clock bump rather than any architectural changes. Gaming tests show little gains in actual AAA titles but the gains seen in synthetic tests such as 3DMark Firestrike are bigger but not representative of actual gaming performance. The second benchmark spree by Expreview consists of clock-to-clock performance tests. Both chips were clocked at 4.0 GHz and tested through all 11 CPU benchmarks that were initially used. The results are a bit disappointing as Core i7-7700K is 0.86% slower in single-threaded and 0.02% slower in multi-threaded tests. 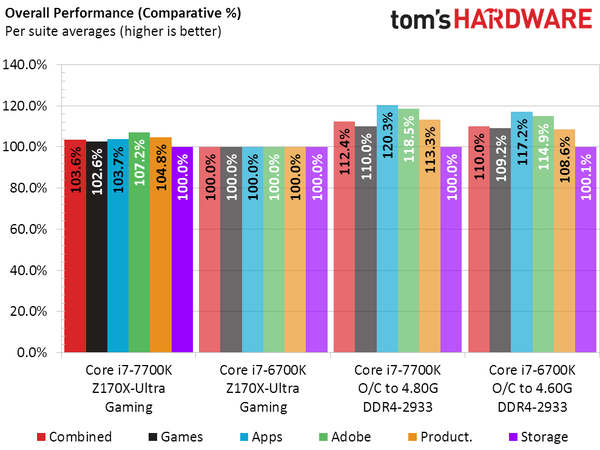 While this may not be a huge difference, we were expecting the 7700K performance to remain in the positive side due to the enhanced 14nm plus node which should help it stabilize clock speeds and performance better than the 6700K but that’s not the case. Same results can be seen in the gaming tests. The power consumption of the Core i7-7700K is 10W higher than the Core i7-6700K. This is due to the increase in clock speeds. The default voltage is also increased to 1.2V while the 6700K sticks to 1.176V. The i7-7700K consumes the same amount of power when supplied the same voltage as 6700K at 4.0 GHz. Temperatures of the 7700K are also a direct result of the increased clocks. We are looking at around 73.6C temps at full load with 4.4 GHz while the 6700K manages 67.2C at full load at 4.0 GHz. Finally, the Core i7-7700K was overclocked to 5 GHz. The testing was done on a Z170 series motherboard instead of the Z270 due to certain issues as stated in the start. The Core i7-7700K was overclocked to 5 GHz with a voltage of 1.296V and was tested in AIDA64 stress test for up to an hour for stability. 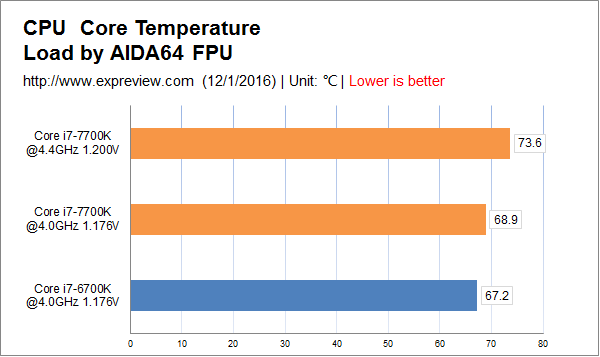 The CPU passed the tests without any kind of CPU throttling and the CPU usage remained steady at 100%. Even with temps hovering around 90C, it’s good to see that the chip doesn’t throttle at all. The Intel Z270 platform is just around the corner which offers new features such as Optane memory support. 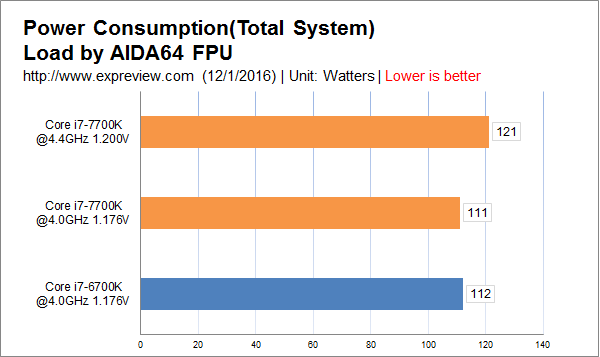 The AMD Zen platform is also arriving soon and is looking quite competitive from the talks. AMD is holding a special Zen event in December prior to their release in Q1 2017. AMD and Intel would battle out on both the mainstream and enthusiast end with their upcoming processor series.